Everyone knows that redheads are on the endangered species list. Therefore, a cop can't just maim or open fire on a ginger. In this case, we're going with Ramona Mayhem (aka, Ginger Bee), who was the mad genius behind this entire plan. 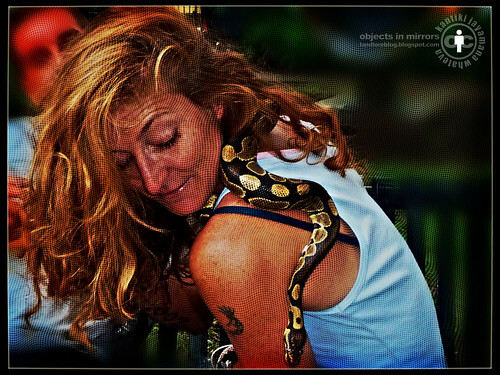 If you can't find a ginger, go with another endangered species (e.g., unbiased media, honest politicians, etc.). Even if you have real police tickets (or other official documents), the last thing you want to do is show them to the police. That gets a peep put into a dark, dark place. Nope, you've gotta make your own ticket. It needs to say something along the lines of "you know what you did" or "shame shame" ...but still say "it's okay, criminals have hearts too". Take note of the all-important "Other" field. When we were out ticketing officers and other miscreants, "Other" was easily the most used. Popular scribs for other were "Looks hot in uniform", "Won't let me pet the K-9" and more. "Not dressed up enuff" saw its share of checkmarks as well. Other key ingredients: humor and artistry. Remember, you're giving them a story and they'll likely tell others about it. A proper ticket will quickly become the centerpiece of that conversation and may even find itself framed on a wall. If you can fit four or more tickets on a single piece of paper, then you save a few trees as well. The favorite scrib to jot in the date field = "Who Cares!?" It's illegal to impersonate a police officer. You're gonna have to get creative with uniforms. In fact, make up your own agency while you're at it. Think parody. 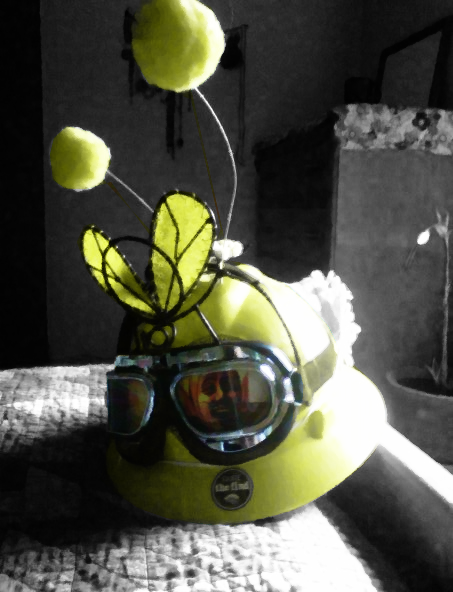 The laws protect parody in art... so get creative... get funny... n get suited up. Here, Mayhem has put on a modified hardhat and is about to put on an orange jumpsuit over the nurse outfit. Creative as ever, Mayhem had cut the jumpsuit into a skirt and brought protective goggles to add an "official" edge to the look. She also brought a beepie-thingie to scan people for weapons and naughtiness levels. Note: Thingie required. You can't just ticket on any beat... you've gotta choose your territory carefully. If you try to ticket a cop who's chasing after someone, you're likely to get arrested or get introduced to Officer Billy Club... and you'd deserve it. We marked out a section of Black Rock City (aka, Burning Man). With even more sheriffs and other police officers monitoring the event this year, we had plenty to hunt down and ticket. 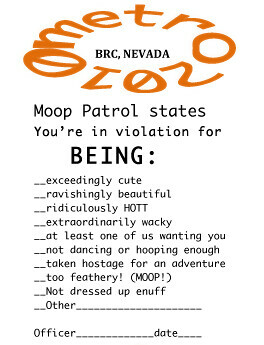 Warning: Do not attempt to ticket an officer outside of Burning Man (or other festival), nor ticket an officer who is obviously "on the move". Do so at your own risk... and to the amusement of the rest of us. The officers you are looking for are those who are parked, standing or just walking along with everyone else. Those are the very criminals who are in need of a good ticketing... and you're just the peep to do it. As a hitchhiker, I've often joked about being "pulled over for walking". Once you've found your target, I suggest opening with something along the same lines as you approach the subject. Now this is the important part: you have to give them the ticket. Even if they cry or have a good excuse for being a police officer, it's your civic duty to make sure they've been officially informed of their crimes. It can be tough when a good cop breaks down into tears, but it's for the best. Be strong. Actually, we found a lot of good humor in the cops we ticketed and with zero tears. Mayhem had to convince me on the first one, but I was all-in from then on. 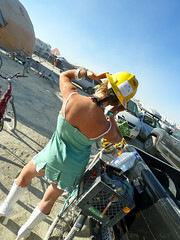 We didn't just stop at the ticket, but asked what their experience was like coming out into the desert at Burning Man. Sure enough, we got one or two trite answers (including a literal "I'd rather be fishing"), but they were still honest answers and authentic connections. 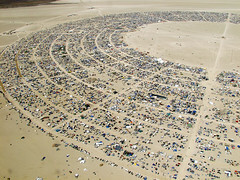 We also got surprise answers with real insights into Burning Man... and we got alotta laughs. Despite the increase in police presence, the officers make sure no one is carrying a gun, they pull over reckless vehicles and they make sure no one burns down the man early... usually. Our tribe in that desert lives much more freely than the rest the world, including crossing lines that society has deemed "criminal". I don't agree with those laws... and it's sad that there are many clashes between the tribe and law enforcement. It was great to breach that divide and make actual contact with some real human beings. Afterall... they're just wearing different costumes. Disclaimer: Do not try any of this. These steps are for entertainment purposes only and may have legal ramifications or cause actual harm. Thank you for reading... and pass it on. Cheers!